The UW-Green Bay Office of the Chancellor e-mailed the following memorandum from Chancellor Miller to UW-Green Bay campus community on Thursday, October 26, 2017. The following message was sent on behalf of Chancellor Gary Miller via e-mail to the UW-Green Bay faculty and staff on Tuesday, October 17, 2017. I am pleased today to announce that Charles Guthrie has been named the ninth Director of Intercollegiate Athletics at the University of Wisconsin-Green Bay. Guthrie, an athletics administrator with over 15 years in collegiate athletics, has spent the last three years as the Director of Athletics at San Francisco State and will begin the new role on November 6. A press conference to introduce Guthrie to the Green Bay community will be held on Thursday, November 2 at 4 p.m. in the Special Events Room at the Kress Events Center. As Green Bay’s Director of Athletics, Charles will oversee a department offering 16 intercollegiate sports, serving 250 student-athletes and having reached tremendous heights in recent years. He will report directly to me and serve on my senior leadership team. I am delighted to welcome Charles to the UW-Green Bay community as Athletic Director. He brings exactly the right expertise in NCAA athletics to move an already fantastic program to even higher levels. We were especially impressed with his strong community spirit, ability to work with coaches and staff, understanding of today’s complex NCAA environment, track record with compliance and his overall love of higher education, sports and student athletes. Since joining San Francisco State, an NCAA Division II institution sponsoring 12 athletic programs, Guthrie has been responsible for strategic planning, implementing, coordinating and assessing core components of external relations, internal operations and compliance with a primary focus on the student-athlete experience, staff and coach development, and fundraising. Please join me in welcoming Charles to Green Bay and the University in the weeks ahead. The UW-Green Bay Office of the Chancellor e-mailed the following memorandum from Chancellor Miller to UW-Green Bay Faculty and Staff on Friday, October 13, 2017. The UW-Green Bay office of the Chancellor sent the following message to faculty, staff, students and trustees on Wednesday, October 11, 2017. 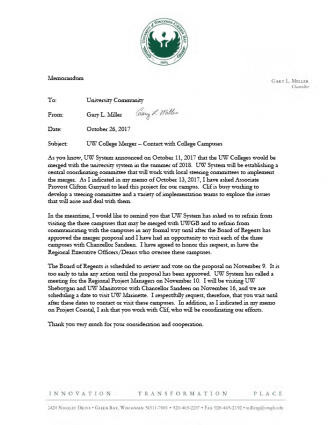 I attach a letter from UW-System President Ray Cross announcing his intention to recommend to the Board of Regents a significant realignment of UW Extension and the UW Colleges. Under the proposal, UW-Sheboygan, UW-Manitowoc and UW-Marinette would become part of UW-Green Bay. The reorganization is to take effect on July 1, 2018. Implementation teams at both the System and Campus levels will begin the work of planning for this transition after Board of Regents approval. We will work closely with Chancellor Sandeen and her leadership team to arrange visits to campus and the communities in the near future. Our shared vision to grow and become a key driver of the economy, education outcomes and community vitality of Green Bay and the surrounding region will take an exciting step forward if the proposal is approved. You play a critical role in realizing that vision. I look forward to working with many of you to set the course for a successful transition and our expansion to a multi-campus university.